Is the Flyboard Air the Next Generation of Transportation? Home » Is the Flyboard Air the Next Generation of Transportation? The Flyboard Air is an “independent propulsion unit,” Zapata says, with the ability to fly up to 10,000 feet high. A real-life hoverboard. It is powered by four engines of 250 horsepower each. 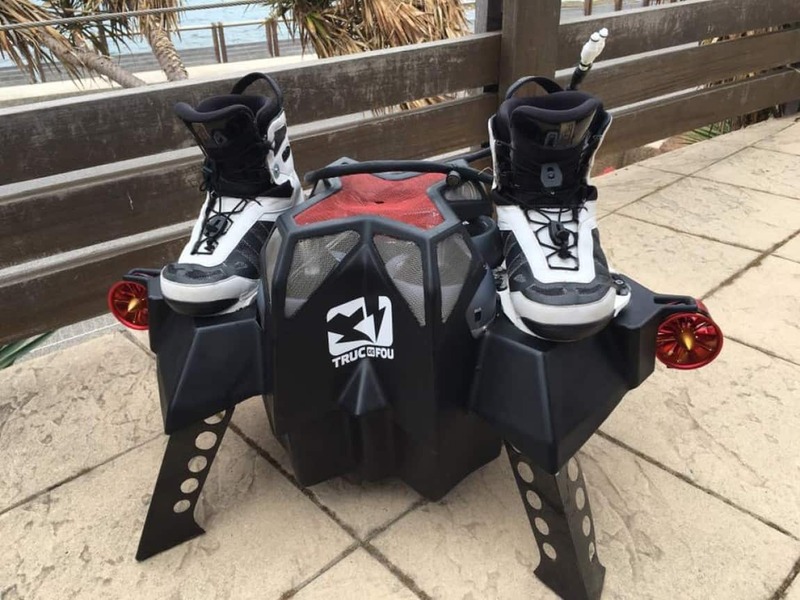 Similar to the original Flyboard, the flyer can control the direction of the board with their feet. However, A “logic system” is built into the Flyboard Air containing a series of algorithms to assist the flyer with stabilization. The flyer also wears a backpack full of kerosine, jet fuel, to give them ten minutes of flight time. On April 30th, 2016, Franky Zapata set a new Guinness World Record for the Farthest Hoverboard Flight. He flew 2,252 meters (7,388 feet) over the coast of France. The previous record was 275.9 meters (905 feet, 2 inches), set by Canadian inventor Catalin Alexandru Duru in May of 2015. Zapata Industries recently announced the signing of a letter of intent for purchase by Implant Sciences, a US military firm, for about $15 million. Implant Sciences supplies the Department of Homeland Security with Explosive Trace Detection equipment. Their president stated, “we are beyond excited to have visionaries like Franky Zapata and his team on board and we are thrilled to allow for shareholders to benefit from the many breakthrough products he has already invented and the new innovations he will be unveiling in coming months and years.” Zapata Industries is already designing other aircraft that would use the same technology for medical and military purposes, such as the Jet Bike, Air Stretcher, Air Cargo, and Air Platform. Unfortunately, the Flyboard Air will not be available commercially in 2016. And although a military supplier is intending on buying the company, Franky’s vision for the product is to be for both military and recreation. The dynamic is similar to the original water-powered Flyboard. The controller used also looks very much like the wireless EMK used for hydroflight products. Franky predicts that in order to fly a Flyboard Air, a person will have to log at least 100 hours on the original water-powered Flyboard® so that they have experience with this type of personal aviation technology. The Flyboard Pro Series is the newest Flyboard on the market and most similar to the Flyboard Air in how it is operated. Flying a Flyboard is very intuitive, the user moves their feet to change the direction of the board. The Flyboard Air uses the same movements, but will also have self-stabilizing technology to assist in balance. To buy a Flyboard, check out our store. This weekend, September 16-18, is the Flyboard World Championship competition in Naples, Florida. You can read more about it in our previous blog post. It has been confirmed that the Flyboard Air will be demonstrated at the event. To receive updates on the Flyboard Air, subscribe to our Flyboard Air mailing list. Will do! The Flyboard Air is currently just a prototype, but we too hope to see it available for sale soon. We will update our Facebook and social media sites with information as soon as it comes out. I know that this will become the future and I am so excited to finally see back to the future 2 come to life. The current version is using fuel to push these engines. Dyson is currently working on battery development to change the industry. If what dyson claims to be true within the years to fallow I am sure that the FLYBOARD could electric. The insane torque that could be made by a motor would be insane… can’t wait to see what this company does, keep rockin folks! These are fantastic. What’s the weight limit of the Flyboard? Any plans of extending the range? The original Flyboard is recommended for riders up to 300 pounds. The heavier the person, the more power it takes to lift them. I too would like to know when the Flyboard air will be sold to the public. How are you planning on developing the technology once its sold to the military, isn’t the purpose of them buying it so they can control the development for there own reasons and not that of cilivan interest? The inventor and CEO, Franky Zapata, has stated that his vision for the Flyboard Air is to be for both military and recreational use. The purchase has not officially been made yet, only the letter of intent to purchase. But we were told we will have more news about the Flyboard Air come 2017. 10,000 ft! That is what the inventor claims. The only thing is that you would need to carry enough Kerosine to get you that high and back. In his test runs, Franky carried a backpack full of fuel and it only lasted him 10 min. Fantastic device!!! Please keep me posted when it can be purchased !!! Is there a way to register to receive updates about improvements, recreational release dates and such? We will update our Facebook page with any news about the Flyboard Air! I have a son that is autisum he loves to fly and speed is his thing please call me i would love if you could fit him your business. The Flyboard Air is only a prototype right now, and not available to the public. Follow our Facebook page to stay updated on all of the newest products. However, if you are interested in the original Flyboard that is water-powered, we have given a lesson to with someone with autism before. Aquatic Aviation is located in San Diego, California. We can give your son a discount if you and your family want to book a lesson. You can email or call us for more details.